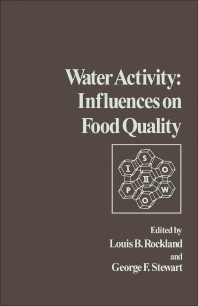 Water Activity: Influences on Food Quality is a collection of papers presented at the 1978 International Symposium by the same title, held in Osaka, Japan. This book is a treatise on the influence of bound and free water on the quality and stability of foods and other natural products. This book is organized into seven sections encompassing 33 chapters. The first sections deal with the characterization of moisture sorption isotherms based on both theoretical and applied considerations, as well as the relationship of bound water to the physical and chemical properties of natural products, including foods. The succeeding sections consider the structure of water and the influence of solutes and solute mobility on water activity and the influence of water and water activity on the structural and functional characteristics of proteins, carbohydrates, and proteins. Other sections explore the influence of water activity and temperature on the rates of several important chemical reactions, such as lipid oxidation, vitamin decomposition, browning, and other reactions, which affect the chemical, physical, and nutritional properties of food. These sections also discuss the influence of water activity on food processing and storage practices from both theoretical and applied viewpoints, specifically the application of water activity principals to the processing and preservation of leafy vegetables, cheese, dried fish, and other products. The final section is devoted to the influences of water activity on the behavior of food-related microorganisms. This section emphasizes the role of solvents in controlling water activity and the related survival of certain microorganisms. This book will prove useful to food scientists and researchers.